Dragonrot is a deadly disease in Sekiro: Shadows Die Twice, and here's how you can cure it. The Dragonrot affliction plays a big role in Shadows Die Twice, and can really hurt your playthrough if left unchecked. 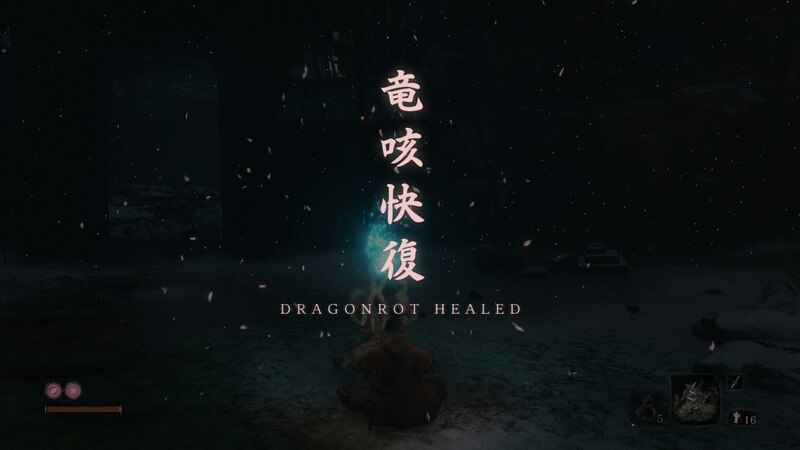 In our Sekiro Dragonrot guide, we'll be walking you through everything there is to know about the disease, and how you can cure it as easily as possible. To begin curing the Dragonrot of all characters in Sekiro: Shadows Die Twice, you need to seek out a character that's been afflicted with the disease. For us, we went and found an old woman between the Outskirts Wall - Gate Path, and the Outskirts Wall - Stairway Sculptor's Idols. Follow the sounds of the character coughing and gasping for air, and you'll find her. When you find the old woman, or any other character in the game that's suffering from Dragonrot, speak to them. After some brief dialogue, you'll have the option to take a sample of the blood that they've coughed up. Do this, because there's no downside whatsoever to taking the blood sample from them. With the blood sample in your inventory, make your way back to the Dilapidated Temple. Now speak with Emma, and select the dialogue option to offer her the Dragonrot blood sample. After the ensuing dialogue with Emma has been concluded, leave Emma, and return just a few minutes later. She'll say that she's managed to acquire a cure for the Dragonrot (that was quick! 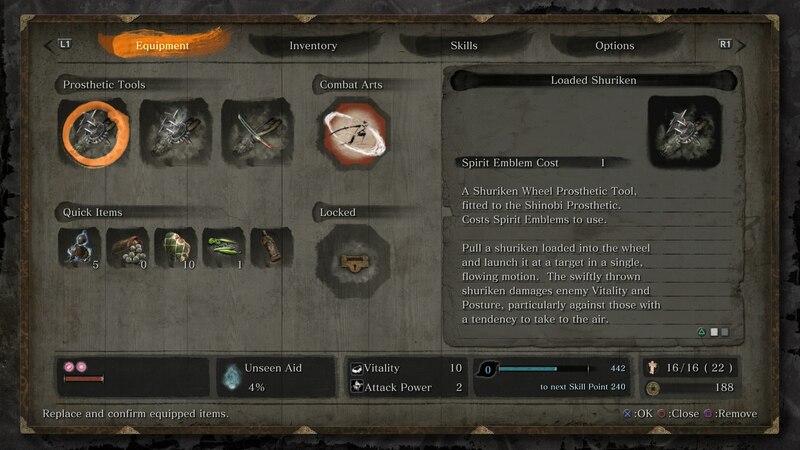 ), and she'll give you the Recovery Charm item, as well as a Blood Droplet. The Blood Droplet is a one-use item, but the Recovery Charm is an item that's here to stay with you. Now go to your nearest Sculptor's Idol. Interact with it, and you'll have the new 'Dragonrot Restoration' option at the bottom of the menu. Select it, and you'll use the Blood Droplet up to cure every character of the Dragonrot disease. You'll now get a notification that all characters with the Dragonrot have been immediately healed. Your Unseen Aid percentage chance in your inventory should have jumped up a fair amount now, especially if you had multiple characters afflicted with the Dragonrot in your game. But there are going to be times where characters become infected with the Dragonrot all over again. When this occurs, you need to repeat the process of tracking down a character somewhere in the game that's afflicted with the curse, and accept a sample of blood from them. 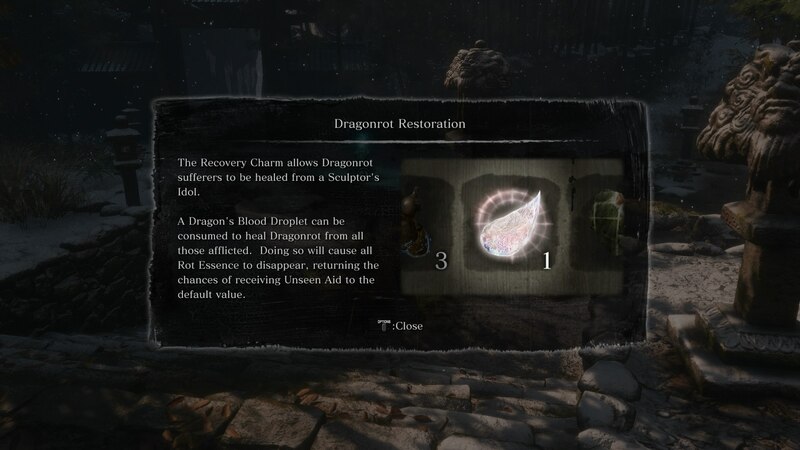 Go back to Emma, give her the blood sample, and she'll produce another Blood Droplet item, for you to use again in curing all characters of the Dragonrot. 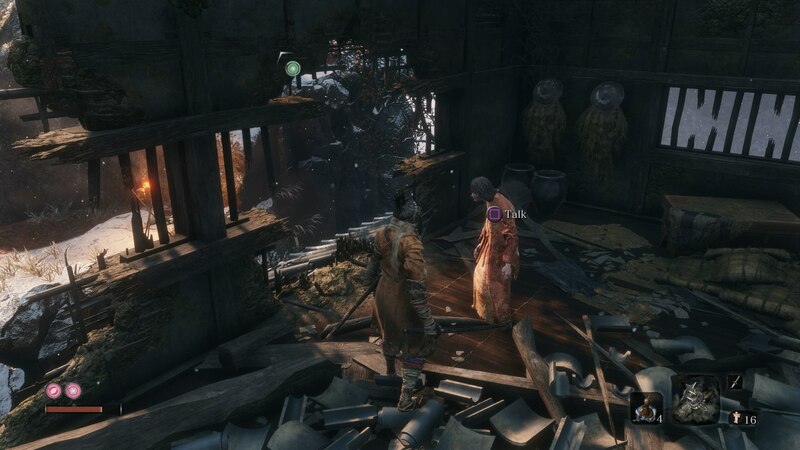 You'll first come across the Dragonrot during some expositional dialogue from Emma and the Sculptor, a matter of hours into Sekiro: Shadows Die Twice. The pair explain that this disease is ravaging Japan, and they're both scrambling to find a cure for it. As you die, more and more characters will become afflicted with the Dragonrot. Don't worry, they won't actually die from the disease, and a character won't become afflicted every time you die (because that would be very, very harsh). 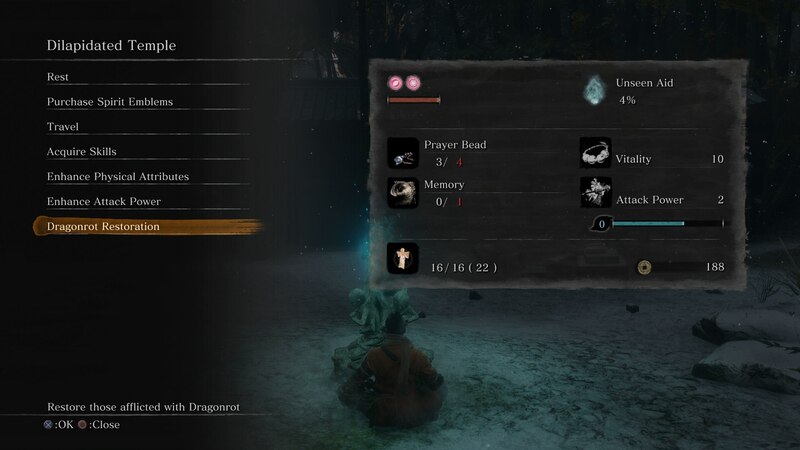 Occasionally when you die, you'll get a notification that someone has contracted Dragonrot, and this is going to negatively affect your chances of receiving Unseen Aid when you die. Unseen Aid is a hidden force at work in Sekiro. If you pause the game, you can see your current chance of receiving Unseen Aid whenever you die, near the bottom of the screen. Every time you die, you'll lose all your progress towards your next Skill Point (gained by earning XP), and half of your coins. Unseen Aid prevents this, allowing you to keep both amounts of XP gain and coin when you die. But it doesn't come around that often. As we mentioned previously, Dragonrot negatively affects your chances of being granted Unseen Aid when you die. So, you're going to want to cure as many afflicted characters in Sekiro as you can, whenever possible.